Displacement of Black and [Latinx] residents accompanied gentrification in many places and impacted at least 135,000 people in our study period. In Washington, DC, 20,000 black residents were displaced, and in Portland, Oregon, 13 percent of the Black community was displaced over the decade. Seven cities accounted for nearly half of the gentrification nationally: New York City, Los Angeles, D.C., Philadelphia, Baltimore, San Diego, and Chicago. 79 percent of gentrifying tracts are within cities with one million or more residents. The displacement numbers seem low, but the authors used fairly narrow definitions of gentrification and displacement. A neighborhood was said to have gentrified if: a) before 2000, it was in the 40th income percentile or below, b) by 2013, it was in the 60th income percentile or above and actual household incomes had risen; and c) education levels had gone up. 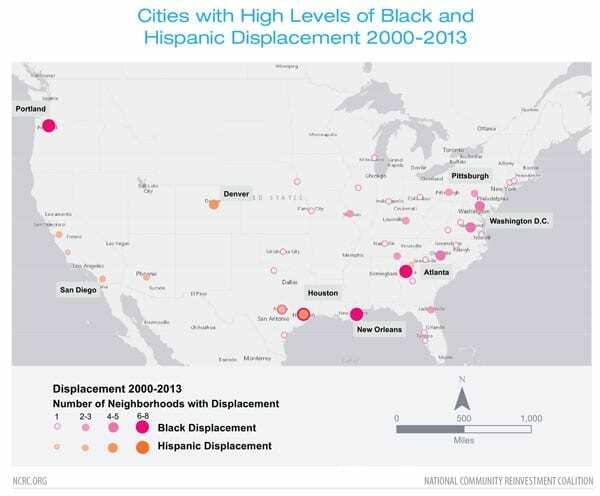 Displacement was said to occur within those neighborhoods if between 2000 and 2010 (the two census years) there was a five-percent or greater decline in the number of Black or Latinx residents. Overall, the study found that 110,935 Black residents were displaced nationwide through gentrification in 187 census tracts between 2000 and 2010, while 24,374 Latinx residents were displaced in 45 census tracts in that same decade. Nationally, Richardson, Mitchell and Franco indicate that 90.7 percent, or 67,153 census tracts are urban, of which 16.7 percent or 11,196 tracts were poor enough in 2000 so that gentrification was possible (you can’t gentrify already wealthy Beverly Hills, for example). Of these, a total of 1,049 census tracts did increase in economic status (i.e., gentrify), with widespread displacement occurring in 232, or 22 percent, of the gentrified tracts. partnerships between banks and community-based organizations to encourage equitable development; limited-equity co-ops and community land trusts; providing existing tenants with the right of first refusal in apartment conversions coupled with low-income and first-time buyer financing programs; inclusionary zoning regulations; and split tax rates for the incumbent residents of gentrifying neighborhoods. Additionally, HUD’s Affirmatively Furthering Fair Housing (AFFH) process provides an opportunity for community groups to engage with municipal leadership in the planning process. AFFH provides a mechanism for identifying areas that are vulnerable to, or may be in the early stages of, gentrification. Community groups can then work to develop strategies to avoid displacement of incumbent residents by attracting investment and providing affordable housing.